So I have some more guest posts coming in the next week or two but I thought I should pop in and share some thoughts with you as well as a verse of encouragment. As I’ve mentioned a little bit here and there, this year I really focused on upgrading some high school courses so I could attend college this fall and I have arrived! But with that, I want to talk about focus and priorities. Reaching your goals takes a lot of doing what you don’t feel like doing and also hard times. And when that happens, sometimes you’ve gotta refocus. I really learned that over the last year as I had to buckle down and do work I didn’t want to do and meet deadlines that feel almost impossible to meet. As I sit here at college having survived the first week of classes I’m realizing that it’s all the same as before. Slightly harder work and lots of it but still the same. And in those moments of stress and frustration when I feel like I’m drowning in all I have to do I’ve had to learn to stop, take a minute or two to just breathe and then reflect about why I’m doing this all and what it’s for. – What the point is behind all this paperwork and daily readings for classes the next day. Refocus on my goals then move forward knowing that this is not pointless. That there is a plan and final goal in mind. So just remember that if you feel exhausted, or swamped with homework, studies, work or even just life to stop and take a minute to breathe and reflect on what will come from what you are doing right now. I’m so excited to have author Heather Manning join me on my blog today for an interview! Heather is an amazing person and her novels are outstanding! So lets do this thing! Hello Heather, and Welcome! Could you tell us a bit about your books? Hi! Thanks for having me! 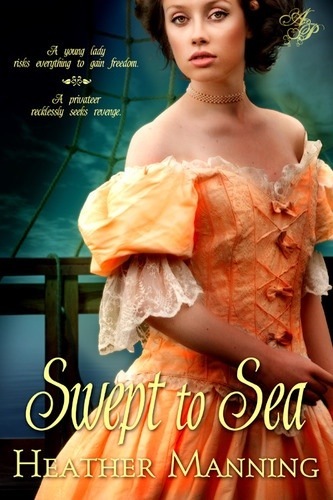 Here’s a little about my first novel, Swept to Sea:Lady Eden Trenton never wanted to leave her privileged existence in London—until her father invites a dangerous suitor into her life. Left with few options, Eden devises the best reprieve she can: escape. Chasing freedom, she stows away aboard a pirate ship, praying she will gain her independence in the colonies before she is discovered by the nefarious crew. The Caribbean is no place for a society lady of London, yet after a daring quest to save a friend, Lady Ivy Shaw finds herself trapped far from home. Now, driven with worry for her young brother, she is determined to return to England in all haste. So, when a new acquaintance offers to sail her to her brother’s side, she jumps at the offer, scarcely caring that the man is a privateer. Captain Gage Thompson is just learning how to be a captain. He sailed for years under the command of his longtime friend, Caspian Archer, but serving a captain and being a captain are, as he soon discovers, two very different roles. While struggling to gain the respect of his newfound crew, he now faces the distraction of beautiful Lady Shaw. He finds himself entranced by her and promises to give her passage home. After a brief stop in Port Royal, Ivy and Gage discover an abandoned child. They both decide to bring her with them on their voyage to England. But problems soon arise in the form of hurricanes and enemy pirates, and Ivy and Gage find themselves scrambling to not only care for a lonely child, but also gain command of a motley crew. Will love bud between Ivy and Gage as they journey home? What inspired you to write both Swept to Sea and Carried Home? I wanted to write a trilogy about three best friends, and I wanted to throw some pirates in. Really, my idea came about kind of randomly. I enjoy writing about a variety of characters, so I was pleased to write my sequel, Carried Home, which stars two minor characters from Swept to Sea, Ivy and Gage. So, since I’m more of a plotter I have to ask, did you write an outline before writing the novels? Or are you a pantser? I write a very loose outline before writing my novels. Actually, with Swept to Sea, I don’t think I really had much of an outline, but with Carried Home I had a limited outline. So I guess I am somewhat in between. Awesome. In between is always cool too 😛 Now, tell me what was the hardest part of writing your novels? For Carried Home, my biggest obstacle was being an already published author. It felt a little weird first, because I was “done” and then kept writing another book. Knowing that people I know and people I’ve never met had read my book and formed opinions about it really made me feel stuck. But I powered through that strange feeling, got my second book published, and I am glad to say that that feeling is gone as I’m writing book number three! Is it bad I already can’t wait for book three? and I havent even read the second book yet haha 😛 How long did it take you (from first draft to final draft) to finish Carried Home? Okay, so since I’ve read the first book, I’ve been dying to know, what is one way you relate to your main characters? Hmmm. I relate to Eden from Swept to Sea in a few ways, I guess. Most of it was subconsciously. Eden looks a lot like me, and she has very brave qualities, yet tends to be a little timid. And I think that’s a lot like me. I always find it kind of cool when a character subconciously becomes somewhat like the author. What was one of your favourite scenes to write in either of the books? Oh! Such a tough question. One of my favorites in Carried Home is towards the beginning, when Ivy and Gage encounter a child being abandoned by her mother. They both want to take her in, but really have no idea what to do with her. I think this scene was one of the first to show us exactly who Gage and Ivy are. Carried Home’s theme seems to deal with matters of worry, control, and poor self-opinion. Ivy tends to worry about things she cannot control and forgets to put her trust in God. Gage seems to doubt his abilities to be a capable, successful captain and I think all of these issues can somewhat be applied to normal people’s lives. There are days when people have trouble with worry or they don’t think they are good enough. Did you learn anything from writing either Swept To Sea or Carried Home and what was it? While writing Carried Home, I learned once again how difficult it is to write a novel. When you haven’t written a bare first draft in a while, you tend to forget just how difficult and just how amazingly fun it is. Oh, goodness, I don’t know! Truly, there are so many amazing authors out there and I would adore having almost any of them as a mentor. What is one entity that you feel supported you outside of family members? Friends! I am a member of a great young writer’s community, Go Teen Writers, and I was supported by many new and now close writer friends there. They made me always feel like I can keep on writing! Go Teen Writers is quite fantastic! I have to agree with you there 🙂 So, last but not least, do you have any advice for other writers out there who are looking into publishing or just writing a story in general? I advice other writers to always write and always read! Those are the only ways you can improve what you do. Also, if you are serious about getting published, I recommend attending a writer’s conference. At a writer’s conference, you are able to meet lots of professionals, attend workshops to improve your craft, and even pitch your work to industry professionals. This is how I met my publisher and got my work published. Oh. And, if you don’t mind. Where can we, as readers, stalk-uh I mean ‘find’ you online? Bestselling author Heather Manning is a young lady who loves to read–and write. After she won several writing competitions, her first book was professionally published and quickly became an Amazon Bestseller. 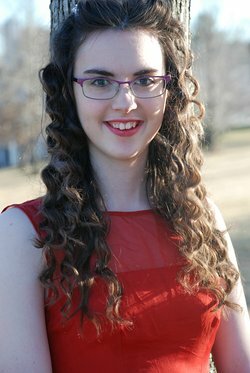 She is an active member of her local ACFW chapter and lives in Kansas City, Missouri where she attends high school, sees plays, devours donuts, and acts in community theatre. You can find Heather on her blog: heathermauthor.blogspot.com.